"We ate well and cheaply and drank well and cheaply and slept well and warm together and loved each other" wrote Ernest Hemingway in A Moveable Feast. Could it have been a wholesome burger that made them sleep so well, asks Tanvi Misra? 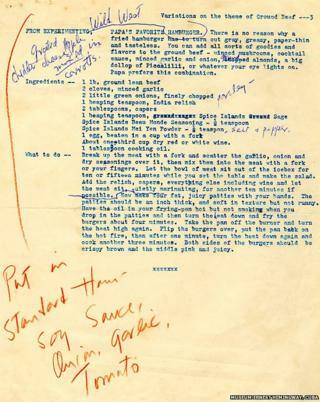 According to Sandra Spanier, general editor of the Hemingway Letters Project, Papa's favourite hamburger recipe - made available in digital form by the John F Kennedy Presidential Library on Tuesday - reveals quite a bit about the author and his fourth wife, Mary. It's no surprise that he liked his burger "pink and juicy in the middle" but what about the soy sauce, and the half-teaspoon of Spice Islands Mei Yen Powder? "One of Hemingway's favourite restaurants was in Havana's Chinatown," says Spanier. He loved Chinese food. Also notable is the sheer range of items thrown into the mix - India relish, capers, wine, parsley... This captures a "gusto that's very characteristic" of Hemingway, Spanier says. "It's indicative of his enjoyment of the pleasures of life," and also the range of his tastes, from low-brow to high-brow. He was as comfortable on a boat with Cuban fisherman, Spanier says, as he was dining at the Ritz Hotel in Paris. As burgers go, this is quite ritzy. Hemingway's passion for food and drink is often reflected in his writing. Whole paragraphs describe the frothy bubbling of pancake batter in a skillet, and the sip from a tin of apricots in one of his earliest short stories, Big Two-Hearted River, Spanier notes. A Moveable feast, published after his death, contains a loving description of eating oysters with cold white wine. Mary wrote that they ate the hamburgers to fortify them for "tramping through the sagebrush after pheasant, partridge or ducks" in Idaho or Wyoming, which they visited every autumn. She typed the recipe out for the Woman's Day Encyclopedia of Cookery while Hemingway was still alive, Spanier says. The version above, with the added "Wild West" tag, was for a later edition. After Hemingway's death in 1961, as relations between the US and Cuba deteriorated, Mary needed help getting back into Cuba to reclaim documents and memorabilia. President Kennedy and Fidel Castro intervened to make it possible - which explains the JFK library's interest in Hemingway's papers. This recipe was among those left behind.